Social Justice is defined as "the view that everyone deserves equal economic, political, and social rights and opportunities". Young Audiences believes that the arts can play a part in fighting against these inequities by shedding light on these problems, helping build a more expansive societal mindset, and inspiring our students to reject the current status quo and strive for more equitable change. Many Young Audiences affiliates offer programs that are specifically aimed towards closing the equity gap in communities around the country by allowing students to explore and discuss issues such as racism, societal stereotyping and bullying through the arts. Encouraging students to look at these issues through the lense of the arts allows them more freedom to express their opinions and experiences through multiple mediums and in a safe environment. Read more about some of the Art-centric Social Justice work being developed by our affiliates around the country. By November 2005, Young Audiences of Louisiana was one of the first youth organizations to reopen its doors in the area. In fact, the first public school did not open until January 2006. We realized that as families returned to New Orleans, there were few quality programs for their children. In addressing this gap in services, we expanded signature arts in education programs and expanded into the youth development sector,” Rickie says. Read full story here. The “Find Your Voice” program is a 2-3 week long digital storytelling residency that gives middle school students the opportunity to study and discuss social issues that are important to them through experimentation with digital media, movie making, and the art of storytelling under the direction of professional teaching artists. Students are encouraged to talk about issues that they feel strongly about which brings out topics ranging anywhere from making friends, to dealing with stereotypes and racism. Read full story here. When San Diego Unified School District Superintendent Cindy Marten was first appointed in July of 2013, she already knew first-hand the impact that the Title I funding had on the students in the district. Prior to Marten’s appointment at superintendent, she was active in SDUSD as both a teacher and a principal and got to experience the programs offered at the school and classroom level. She felt that the Title I funds that the district was getting were not being utilized in a way which maximized the impact on their students. She felt that investing some of these funds into arts education and arts integration practices was the best way to maximize the positive effect that could be had and the research agrees. Read full story here. This past summer, Young Audiences New York (YANY) took to the streets to help support the Cypress Hills Local Development Corporation (CHLDC) in their efforts to increase access to fresh foods for the Cypress Hills Community. The event was the beginning of a new partnership between the two organizations and featured a vibrant performance and dance lesson from 7th Principle Dance and Drum Ensemble as well as an open air fresh food market. Through offerings such as the fresh food market, YANY and CHLDC hope to encourage concious, healthy eating. CHLDC also provides free cooking workshops and nutrition education, and focuses on selling seasonal fruits and vegetables sourced from local farms within a 250-mile radius. Read full story here. 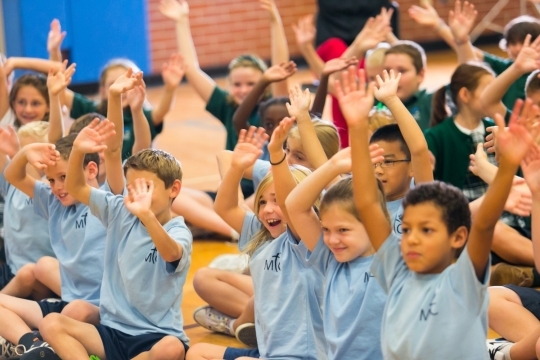 On September 19th, 2015, Young Audiences New York’s Literature to Life program presented a performance and professional development workshop for 100 Charleston County Public School Teachers, in Charleston, South Carolina. Young Audiences New York has designed this professional development workshop to support teachers to integrate the arts and social justice into their classrooms, as they learn to facilitate student discussions on issues of social justice and civic action- in the past, present and future. Read full story here.